UPDATE: Click HERE for free printable shopping lists to go with this menu! Or click here for ANOTHER 31 day menu of THM meals, or check out some $7 THM Family Dinners HERE. Before I share a month of meals, I'd like to share my top time-saving menu planning tips. Work and homeschool keep us SO busy that these little sanity-savers make it easy to meal plan and to get food on the table. 1. Repeat the same breakfast and lunch menu every week. The kids are happy eating what I eat for breakfast and lunch, and repeating the same meals for breakfast and lunch saves time and money. There isn't really an opportunity to get tired of a meal when you only eat it once a week. 2. Once a week (at least), I double or triple a recipe and freeze the extra meals. This is a lifesaver because I get a fully-stocked freezer without spending hours of prep and hours of once a month freezer cooking. As you can see on this menu for the month, I did most of my double and triple recipes at the beginning of the month because I knew the end of the month would be crazy. Usually I double or triple recipes 1-2 times per week throughout the entire month. Above is my list of meals, and below I've included links on where to find the recipes for everything that's not self-explanatory. Many of these recipes are Paleo-friendly, also. Joseph's Pita Pizza (S) (THM book). For GF option, make Fooled Ya Pizza Crust (THM book), OR substitute very thinly sliced chicken breasts for the crust. It sounds weird, but if you make them thin enough you can get a crispy pizza “crust”. Chicken Cobb Salad (S) (I use dark leafy greens instead of iceberg lettuce, and dress the salad individually with 2 parts Ken’s Ranch Dressing mixed with 1 part water). Ham and Bean Soup with sprouted or homemade sourdough (THM book). Or for GF THM, use Trim Healthy Pan Bread. (Many ham and bean soups will work with THM. One important substitution to keep the fat low for an “E” is to use a ham bone without the meat, or with just small amounts of meat. You still get all of the flavor). 15. Mexican Baked Eggs (E) (To make this THM-compliant and gluten-free, I skip the tortillas and only eat the egg whites with mine. The kids have the whole egg with cheese). ** Make sure you use gluten-free cheese and tortillas in recipes that call for them! ***Most oats are not gluten-free! So if you are eating gluten-free (especially if you have Celiac Disease, like we do in our family) make sure your oats are gluten-free. I’m glad someone is able to use it! Thanks! So helpful! Thank you so much for sharing. Uhmm… is it awkward for me to say I love you right now? Because, I do. This is so great! 😀 Thanks! LOL I’m glad you’re able to use it! I’ve been on plan for a year and I remember feeling desperate for ideas for meals, so I thought I’d share. Thanks! Thank you so much! This will be very helpful! Have u tried freezing the casseroles? Just wanted to make sure its been tried and tested… 🙂 Thanks again! Thanks Lisa! Yes, if it says to make double and freeze it, then they have been tested, frozen, and reheated. I see Ezekiel bread and Joseph’s products in your list. Are you substituting these to be gluten free? Yes! I’m sorry I didn’t make it clearer. I didn’t have room to write out all of the gluten-free options on the graphic, so the details are typed out underneath the graphic. Thanks! God bless you! Baby #7 arrived in January and I have really struggled with THM and juggling everything. Thank you for sharing your gift of organization. I’m glad you think it will be useful! I’ve done THM for 12 months and got to my goal weight eight months ago but I love it so much I have the whole family eating this way. I’ll be posting more of these soon. Congratulations on baby #7! I have really enjoyed reading your menu plan. Beautiful, simple, family friendly plus the gluten free “work” has been done for me. Thanks Cathy! I did have to specify the gluten-free changes in the notes, since they wouldn’t fit on the image, but I’m so glad you’re able to use it! One of my kids has Celiac disease, so I’ve had to figure out meals that can be adapted for my husband (doing THM without needing to worry about THM), and GF for me and the kids (although we add a lot of crossovers for the kids). I’m glad other people are finding this useful! Thanks! I’m glad this is helpful. I have to tell you, though, that I tried the plan without the book but I didn’t get really good results until I read the entire book. It really taught me how my body works and how to eat! I borrowed it from the library, read it, and then saved up and bought a copy as soon as I could. I highly recommend it! Wow! I was just sitting here, wishing I had someone else to plan a whole month of gluten free THM recipes for me! 🙂 Thank you!!! I’m glad you can use them! I plan to have more up soon. Thanks! Thank you so much for sharing this! I too am gluten free so this is DOUBLY helpful! You are a blessing. Thanks for taking a look! I’m glad it’s helpful to you! I wish I could have fit all of the GF instructions on the actual menu, but I had to settle fitting all of the instructions underneath. Thank you for this! I’ve seen other meal plans, but most of them are foods I just don’t like or won’t eat. Every one of these ideas sounds like something I will like! I have an idea for you… try putting your website on your graphics. I printed out the jpg of the 31 meals and when I just looked at it, I thought it would be nice to have your website right there. But I pinned it, so I’m good, lol. I can’t thank you enough. I feel so encouraged as I begin THM because of your help. I was drowning in all of the info, and trying to figure out if each meal would be E or S. I have made copies of the recipes from sites, and am composing a binder…feel ready to GO (at least for this month). God’s best to you, because that is the BEST that there is! A word of encouragement for you as you homeschool and wonder if your kids are getting all they need (if you do/I did constantly). We taught our sons at home 4th/7th til graduated…one is a high-end web developer, father of 3 and will begin homeschooling his children next year (he is 32) the other is an ER physician after obtaining his PhD first (he is 34) and they just had their 1st child! Wow, thanks! I do frequently have to remind myself not to stress about my kids, and your story is very encouraging! I hope to post a shopping list and more menus very soon, and I hope they are helpful! Thanks, I’m so glad you’re finding it useful! I’ll be posting a shopping list to go with it soon, and more 31 day menus in April! Cannot find Just Right Porridge website/blog. Do you have an alternative coffee cake recipe for S breakfasts? Thanks. This is an absolutely wonderful list! I cannot wait to use it. However, I’m running into the same issue. Do you have the recipe printed somewhere? Thank you for sharing all your hard work! I so appreciate it!! You’re welcome! I just added the shopping lists to go with the meals today! I just came across this post on Pinterest! I only recently heard about THM from a friend and I’m also gluten free/celiac. I am every interested in these dinner recipes but I’m wondering….what does the (S) and (E) stand for?? Hi Jackie! 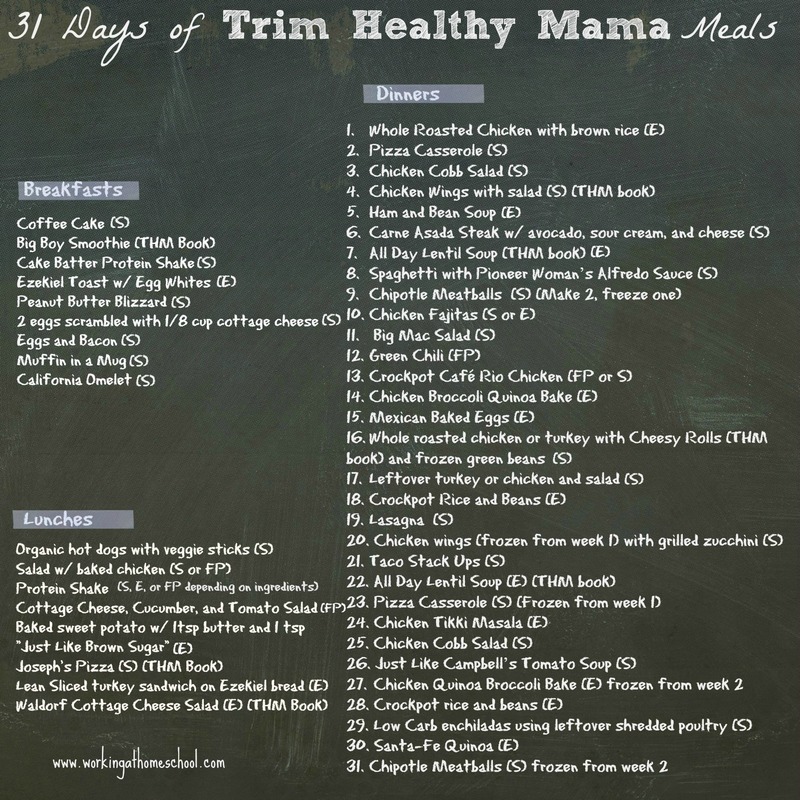 The Trim Healthy Mama book explains different meal types and how to utilize them to lose weight and get healthy. The “S” and “E” are two of the meal types. I highly recommend reading the book! I lost 30 pounds and have kept it off for over a year. I’m still going to look around, but I’m not seeing the instructions to the recipes that I like. I made a list from the 31 days of recipes. I don’t see Salman, green beans, & salad (it might have said a specific salad) Chicken, broccoli, with alfredo sauce, Chicken club salad, and many more. I think you might be looking at the wrong menu! 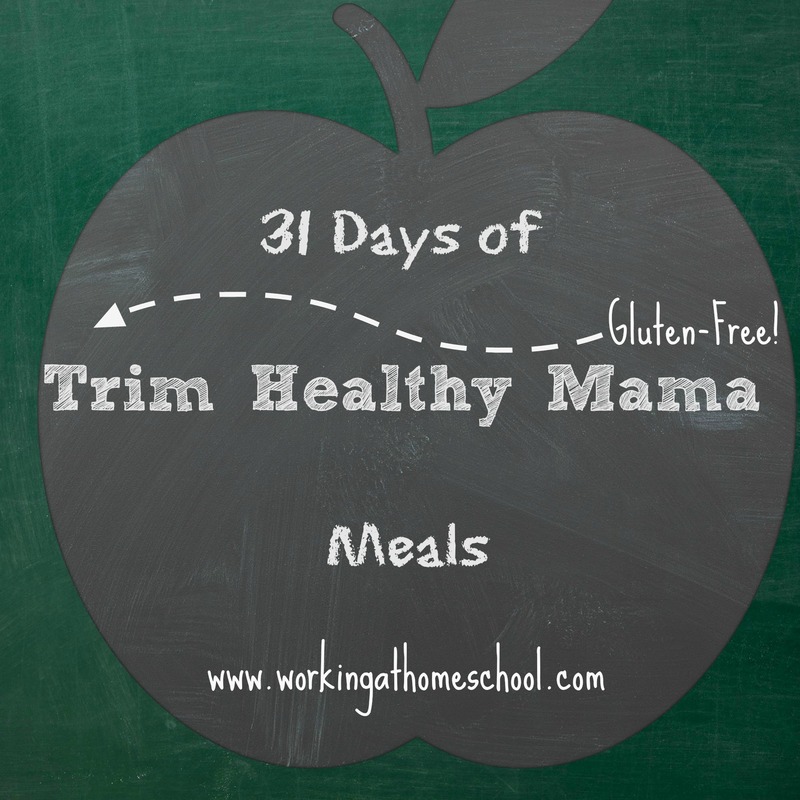 The menu you commented on doesn’t have those meals included, but this one does, and the recipes are linked there: https://thewellplannedkitchen.com/2014/04/20/april-31-days-gluten-free-trim-healthy-mama-meals . Tremendously helpful. Thanks for sharing! This is just what I needed! Thank you from the bottom of my heart for all of the hard work you put into this for us! I do have a question though, what recipe did you use for the Carne Asada Steak w/ avocado, sour cream, and cheese on day 6? I am very excited about this great tool you have created. I was looking at the recipes and printing them out, when I noticed that some of them have both Fat and Carbs. Like the carne asada recipe for instance. I have read the book and I am still confused. Would this be an S helper? instead of an S? Thank you so much for your response. That makes so much sense. I am really looking forward to using your meal plan. I made the sour cream crumb cake for breakfast on Easter and was very happy with it. Thanks again! Correct me if I’m wrong, but I think the Dashing Dish cake batter shake is an E. You are using all lowfat ingredients in it. I think all her shakes are E’s. They are really yummy! They are actually FP, because there has to be a carb source to make an E. For example, she has a peach shake that would be an E. 🙂 because it’s so important not to mix fuels, I marked the shake as an S in case someone uses a higher day cottage cheese (like I did by accident the first time I had this shake!). I also like to add a tablespoon of coconut oil or MCT. 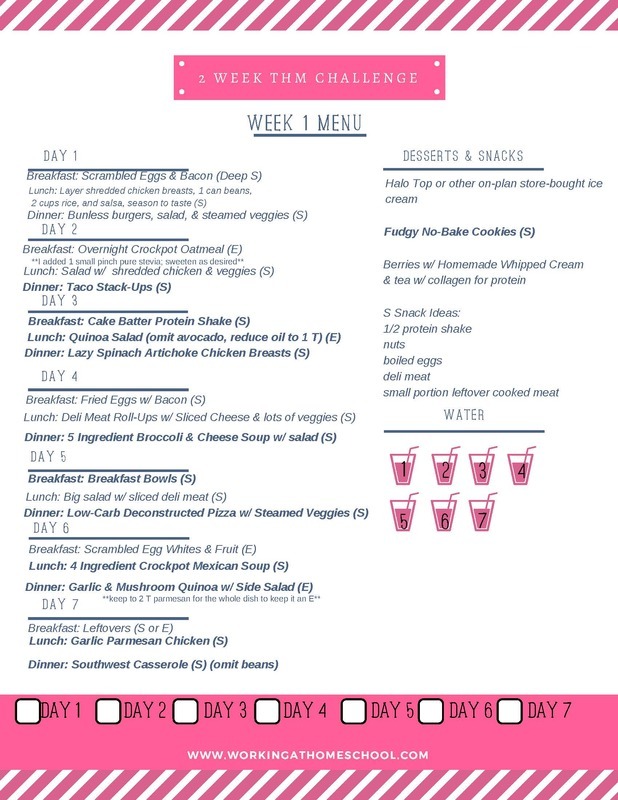 Have done a couple meal plans before and love them, so I would love to give yours a try! I am completely new to THM and am not looking to loose weight, but for healthy wholesome meals for the family with less carbs. The recipes that don’t have a link for a recipe, what do we do with those? The ones that don’t have a link, but say in THM book, can those be found maybe on Pinterest if you don’t have the book? Where can this book be purchased if it is necessary? Thanks you so much for all your hard work you have put into this for others! What did you eat with the steak for week one? Just the steak with avocado and cheese or do you usually add something to it? Also how much of the steak/avocado/cheese do you have? When i click on the link for Coffee Cake from Just Right Porridge (S) it sends me to a link of ads for other websites with recipes. Can I make any of those? I am not sure what coffee cake recipe I should be using for the first breakfast. Hi! I’m so sorry, but it looks like the Just Right Porridge website closed down. I found a great THM approved alternative here: http://rohndasue.com/2014/03/28/coffee-cake-s/ . Thanks for letting me know! Hi! Thanks for this! I have a question. The Quinoa salad (with black beans) looks so good! You commented that, to keep it an E, you use less than the 1/4 cup olive oil. How much do you use? Thank you ? Hi Elizabeth! I’m sorry I didn’t clarify that before. If you use the full 1/4 cup, it ends up being almost 2 tsp per serving, which is too high for an E recipe, so I reduced the olive oil to 1/8 cup and it was perfect. Hi! So glad I found your meal planning guide! Thank you for putting it together! I wanted to let you know that I tried to follow the link for Rhonda Sue’s coffee cake and it does not work. Is there another way to retrieve that recipe? I believe I heard somewhere that she shut her site down. Thanks again!